Valentine’s Day is Saturday and many of you have requested I share some ideas for celebrating this holiday without spending a lot of money. I briefly considered writing an article, but I have to tell you that we’re pretty plain Jane folks when it comes to Valentine’s Day. In fact, we don’t usually do much outside of a nice meal at home or maybe decorating some Valentine’s cookies. However, even if I’m not bursting with creative inspiration when it comes to February 14th, the frugal blogosphere certainly is. In fact, there are more great ideas floating around out there then you could probably do in a lifetime of Valentine’s days. Sarah at Fiddledeedee has some unique ideas and yummy recipes posted including one for chocolate fondue. Centsable Momma walks you through making homemade chocolates. Amy at The Finer Things in Life encourages you to celebrate big without spending big. 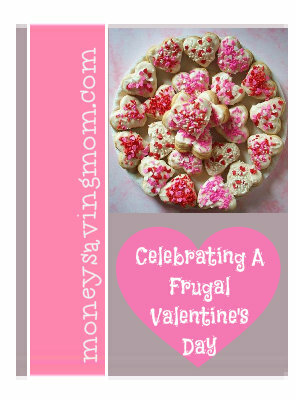 Thrifty Mommy gives you ten ideas of ways to save money this Valentine’s Day. Claire from Choyster Cash suggests an inexpensive date idea and Mercedes shares tips for having a fancy dinner on a budget. you and your spouse can trade gifts and admire each other’s frugality. « Super Savings Saturday… my picture is coming in a little while! I think people go overboard for many ‘minor’ holidays and it’s not usually in their budget to begin with. There are so many little things you can do to celebrate and still make the day special! Sorry! Sorry! Sorry! I put this link in the wrong one, it’s supposed to go under the giveaways one! So sorry! Thanks so much for the link. My husband will be thrilled to know his idea has hit the mainstream! My husband usually does the last one. It works because our first date was on February 15th. I think that’s more special to celebrate than Valentine’s day anyway. We usually don’t do Valentine’s Day gifts- usually, the things that we’d really like to give or receive as gifts are too expensive (like jewelry). Instead, we just try to make the day special by spending time together and just letting each other know how much we appreciate each other. We sometimes also give each other cards, but my favorite ones are the frugal ones, anyway- blank cards with a personal note inside are much better than the cheesy pre-written messages. Thanks for letting me link to my blog! We’re doing Valentine’s on the 15th this year. Our church is having a showing of Fireproof followed by a soup and sandwich fellowship. I thought I’d let you know that on my site I’ve posted 33 really cheap or FREE date ideas. I like these ’cause they are creative and lots of FUN! Check it out if you get a chance. I’m hoping to inspire some frugal celebrating this Valentine’s Day. Thanks for all you do!! I just have to say just one more time how very much I appreciate your website and blogging gifts to those of us that have saved so much money and used our money more wisely! I was just thinking today about how much money you have saved our family and also how much I appreciate your sharing your wisdom with us…it’s truly a generous gift of your time! And thank you also for the great encouragement that you give your readers! Thank you! Thanks for the link. As a new blogger (I was off the radar for a while) I am not sure how to link everything. i added myself twice. Sorry:( i don’t know how to delete the first one. Have a great Valentines day. Thanks for the forum to express our thoughts.